2013 was an important year for me. 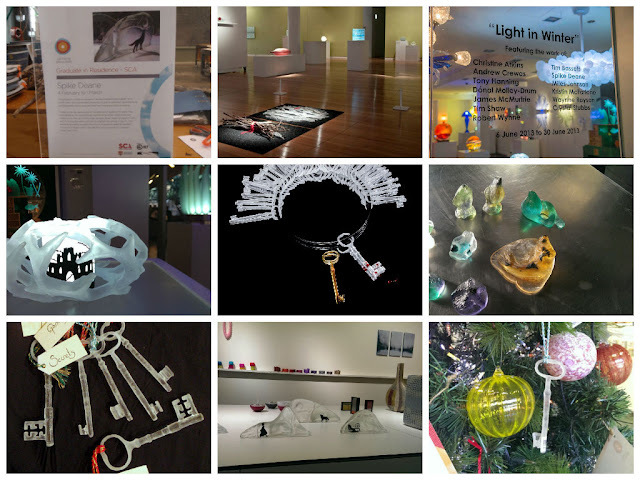 In 2012 I finished my Bachelor of Visual Arts degree in the Glass studio at Sydney College of the Arts and 2013 was going to be my first year out in the world as a non-student artist. So how did it go? Right after I finished my degree (in late November 2012) we move from Sydney to Canberra for Dougie's work. January: We were living in a motel, I applied for a graduate residency and worked out a new installation piece on the motel room floor in between the beds. February: I was one of 4 graduates in residence at the Canberra Glassworks, it was a great experience. March: We moved out of the motel into a house with a garden, garage and shed. My work 'the Woodcutter's Daughter' was on display at the Ausglass members show at Wagga Wagga regional gallery. April: I took Masa's class Joy & logic in coldworking and reworked an installation piece that would show for one night at Sydney University for a fundraising night. June: I exhibited 'Talia's lamp' at Kirra Gallery in Melbourne. September: I cast more glass keys and finished 'The forbidden chamber' which exhibited in Art & About at a pop-up gallery in the Rocks. I ran an Adults beginner casting class at the Canberra Glass works and sent in a proposal for a joint exhibition at M16 Artspace. October: I ran 3 kids casting classes at the Canberra Glassworks with the theme of Antarctic animals. November: I made more keys, this time as ornaments and polished and drew figures for the woodland scenes. I recieved news that our submission to M16 was successful. December: I finished the woodland landscapes to show in Bilk's 'Hollydays' exhibition. I made gifts, which unfortunately are still in the kiln. A good first year as an artist. 2014 already is proving to be extremely busy!